Hello friends. 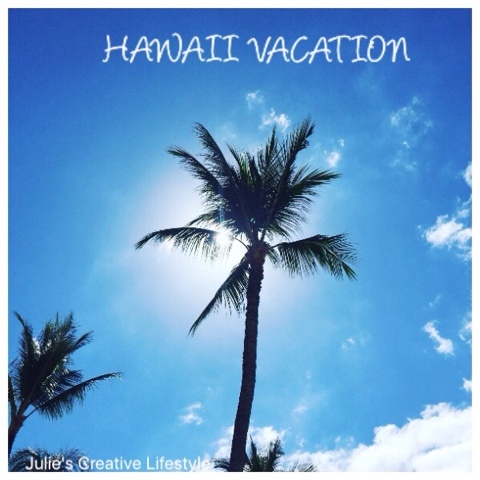 Incase you missed Part 1 of my Hawaii vacation you can click HERE to see it. I am sharing with you Part 2 of our trip to Hawaii. The hotel we were staying in, the Hilton Hawaiian Village had a Waikiki Starlight Luau show that we saw and it was spectacular. When we arrived for the show, we had our photo taken and then we were each given a fruit drink or a Mai Tai. We all sat outside in a large area with many tables and we sat and chatted with the people sitting at our table. 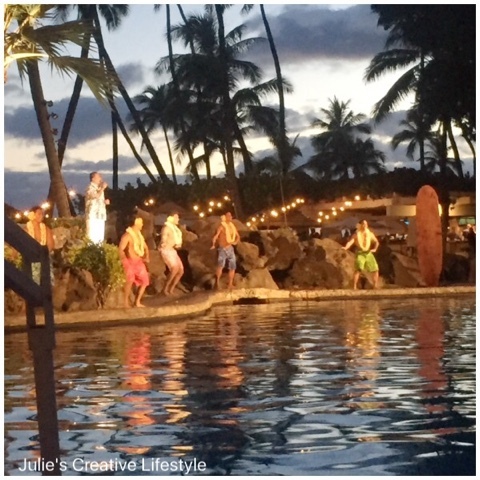 We watched a show of many Hawaiian performers that sang and danced and we also had a buffet dinner that consisted of many different Hawaiian foods and we even had a Luau lesson. 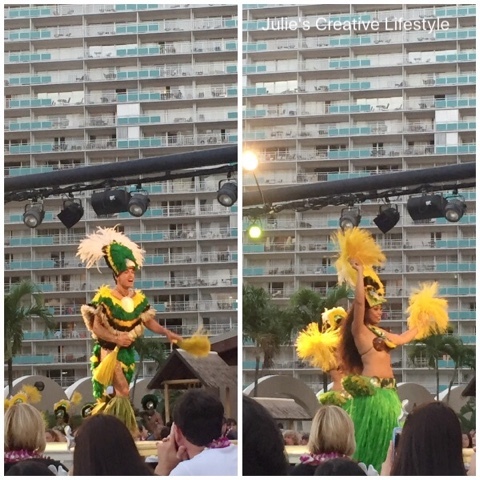 Below are the Hawaiian Performers and their colorful costumes. We saw a fabulous show and fireworks another night, where we were all seated around the pool area. Again, we were each greeted with a fruit drink or a Mai Tai and we then waited for it to get dark outside for the show to begin. The large building below is the hotel (Rainbow Tower) where we stayed in and it was the perfect location to the pool and beach. There are many towers to stay in on the property and they even filmed the Elvis Presley movie Blue Hawaii at this resort in 1961. 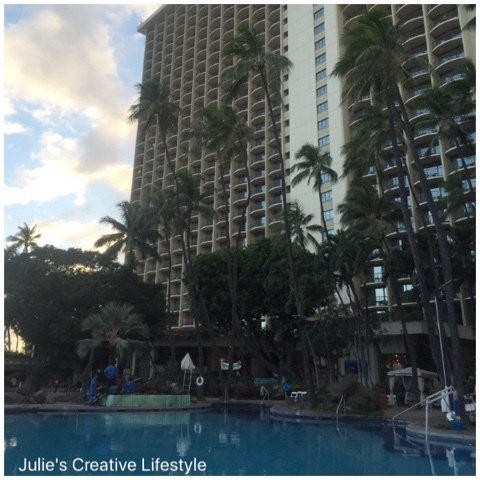 You can read more about the history of the Hilton Hawaiian Village HERE. 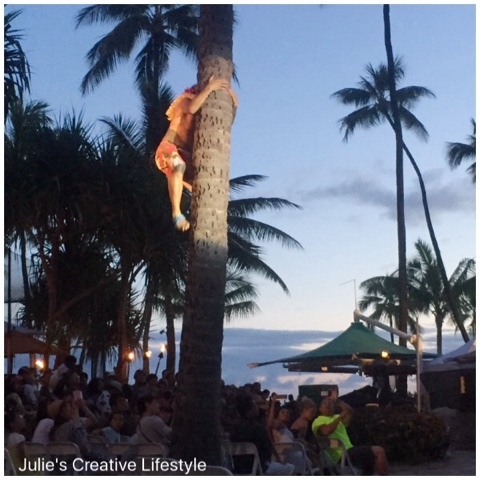 The show consisted of many performers that danced and sang and one of them actually climbed up a palm tree. The man singing below, reminded me of the performer Don Ho, where he sang while the performers danced. 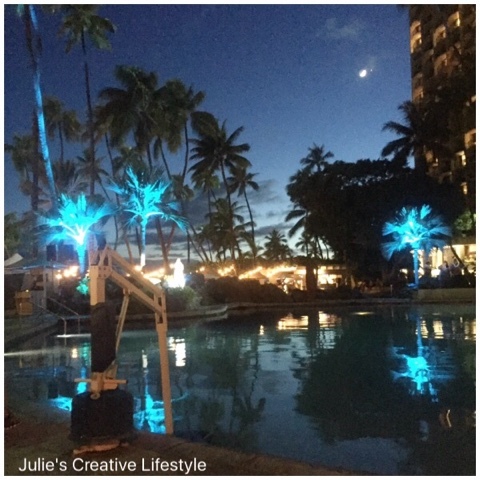 At sunset the pretty palm trees all lit up with blue lights overlooking the pool area. Near the end of the show we saw a spectacular fire works display that lit up the sky. There were also many wonderful restaurants and plenty of shopping on the grounds. They had a store that we loved called ABC Stores, where they sold all kinds of toiletries, souvenirs, makeup, and even food, such as sushi, salads, sandwiches, breakfasts foods, snacks, and even beer and wine. We loved this store and we picked up our breakfast and lunch for the rest of the time we stayed in Honolulu. Well, that is it for Part 2 of our Hawaii trip, and I enjoyed sharing with you some more photos of our vacation. Stay tuned there is more to come of my Hawaii trip! Hope you enjoy the end of the week and have a great weekend. See you all back here on Monday for Cooking and Crafting with J & J Link Up. 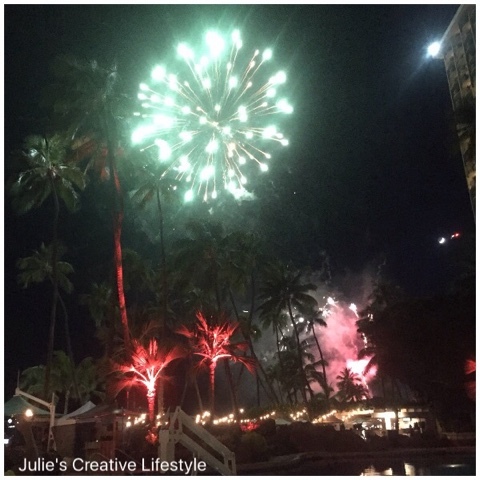 This looks like fun, Julie! I remember seeing a show like this at The Polynesian in Disney years ago. 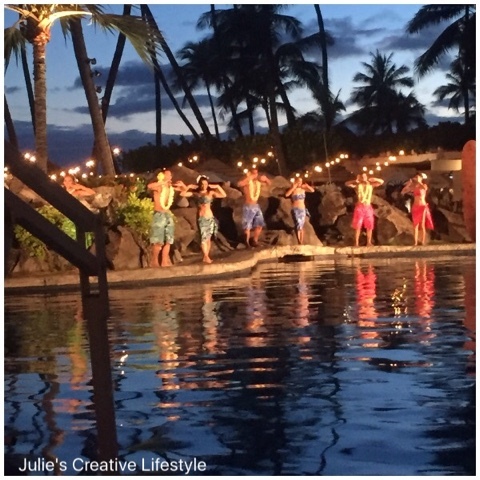 I can only imagine that seeing it performed IN Hawaii must have been spectacular! Sounds like a wonderful time and so very beautiful! Hi sweet Julie! I just got done looking at part one of your trip. My, what fun you had! Thanks so much for sharing with us :) Hugs to you! It looks so tropical and inviting! It's so nice to share your wonderful time with us while it is fresh and then to have it forever on your blog! I wish we had internet when I went to Italy! It's all just memories in my head and some pictures. What a fun time! Now I want to throw a Luau (or go to Hawaii!) I hope you have a lovely long weekend, Julie! It looks so incredible!! I remember going to a luau in Hawaii and it was lots of fun. Sounds like a great trip and that ABC store sounds really cool! Can wait to read more, Julie!